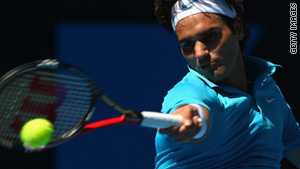 Roger Federer returns a shot against Igor Andreev in match play on Tuesday. (CNN) -- Men's world No. 1 tennis player Roger Federer rallied on Tuesday to open his play of the Australian Open in victorious fashion, beating back a stiff challenge from Igor Andreev in four sets. Federer defeated the Russian 4-6, 6-2, 7-6, 6-0. The match held some of the few dramatic moments in early play on Tuesday as most favorites on the men's and women's side won in easy fashion. On the women's side, No. 1 seed Serena Williams opened her defense of the Australian Open crown in style, crushing Urszula Radwanska of Poland, 6-2, 6-1. Playing with her right leg heavily strapped, American Williams said the match was more difficult than the final score. "I was happy to get through," Williams said, as reported on the Australian Open's Web site. "The scoreline seemed to be easy, but it was a long match out there. So I was just happy to get it over with." Serena Williams' sister Venus, the tournament's sixth seed, makes her entrance later Tuesday against Czech Lucie Safarova. Elsewhere on the men's side, 6th seed Nikolay Davydenko of Russia defeated Dieter Kindlmann of Germany, 6-1, 6-0, 6-3; 9th seed Fernando Verdasco of Spain beat Carsten Ball of Australia, 6-7 (4/7), 7-6, (7/1), 7-5, 6-2; 12th seed Gael Monfils of France beat Matthew Ebden of Australia, 6-4, 6-4, 6-4; 14th seed Marin Cilic of Croatia defeated Fabrice Santoro of France, 7-5, 7-5, 6-3. Elsewhere on the women's side, 8th seed Jelena Jankovic defeated Monica Niculescu of Romania, 6-4, 6-0; 11th seed Marion Bartoli of France defeated Rossana De Los Rios of Paraguay, 6-4, 6-1; 13th seed Samantha Stosur of Australia beat Xinyun Han of China, 6-1, 3-6, 6-2; 19th seed Nadia Petrova of Russia defeated Edina Gallovitsof Romania, 6-3, 6-4; 20th seed Ana Ivanovic of Serbia defeated Shenay Perry of the United States, 6-2, 6-3.